Click pictures for full size image. The HoneyBee for 2016 now has the wheel mounted on the back of the upright. 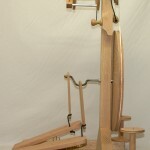 This makes treadling smoother and the wheel is more steady when folded. Changing whorls is much faster. It is an excellent wheel for beginners, and because it folds, it makes it easier to carry to those important ’spin ins’. It has all the features of the basic BumbleBee but we have added some options and made them standard on the HoneyBee. 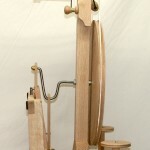 The HoneyBee includes scotch tension, has a built in Lazy Kate, 2 Standard Bobbins, 1 Jumbo Bobbin and a Jumbo Flyer. Intermediate and advanced spinners will be pleased with its 2 spinning ratios. With available ratios from 4:1 up to 20:1, custom made to order in pairs and any combination in even numbers. As with all our spinning wheels, the HoneyBee is made from solid Red Oak hardwood. The wheel axle is on two sealed bearings for ease of treadling and the flyer axle also has two bearings for quiet operation. The bobbin is also on two sealed bearings for quiet operation. No other wheel offers sealed bearings at this price! 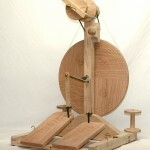 We do not use plywood or MDF on our spinning wheels. Our wheels are heirloom quality spinning wheels that will last for generations to come. 6:1 and 8:1 spinning ratios is standard, any pair between 4:1 up to 20:1 can be ordered separately. Folding requires folding up the base and putting the pin in a special hole to secure the base upright. 2 bobbins (3.5 inches diameter x 4.25 inches long) are included. With a built in Lazy Kate. See accessories listings for extra bobbins, Free standing Lazy Kate, and extra whorls.